Hundreds of plant and animal species call the North American Great Lakes home and humans rely on the lakes as a source of clean water for drinking, fishing and four-season fun. Lots of hard work from many dedicated organizations and individuals in Canada and the United States help keep the Great Lakes ecosystem healthy but the lakes are still threatened by pollution, invasive species and climate change. Check out our video for an introduction to the Great Lakes and find out how they were formed, how they are managed and why they are so important. Now that you’ve scratched the surface of the Great Lakes, dive deeper with Toronto Zoo’s Great Lakes Program! Get to know some of the amazing aquatic species living right here in the watersheds of the Great Lakes and get involved to help protect these locally endangered fishes and molluscs. Through these examples, in-class presentations emphasize the importance of protecting aquatic ecosystems for both animal and human use. Outreach presentations are tied to the Life Systems strand of the Ontario Science and Technology Curriculum and are offered at NO CHARGE for Grades K-12. 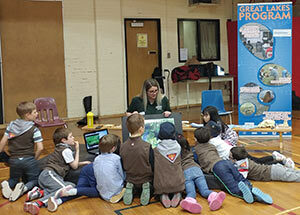 Over 20,000 educators and students participate in our Great Lakes Program annually. Reaching beyond the classroom, the Great Lakes Program also has 3,000 public participants annually (camps, libraries, festivals, etc.) and the Program contributes to habitat rehabilitation through shoreline clean-ups and tree plantings. Public events both off and on the Toronto Zoo reach even more people with the message of water conservation through the Great Lakes Program. Some events include: Party for the Planet, water festivals throughout Ontario and water-based workshops at the Royal Ontario Museum. 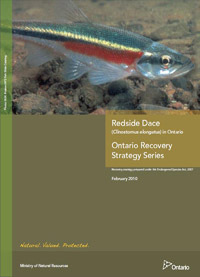 Financial supporters include the Ontario Ministry of Natural Resources Species at Risk program, the Environment Canada Habitat Stewardship Program and Ontario Streams. Aqua-Links is an exciting new conservation effort at the Zoo linking students in Ontario with students in Uganda to discuss water conservation. Focusing on these two Great Lakes regions of the world, the program fosters stewardship and appreciation for water as a precious resource, as well as for the fish that call these lakes home. 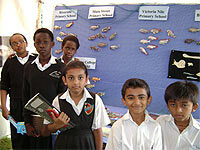 Highlighted for their ecological and nutritional significance, Atlantic salmon in North America and haplochromine cichlids in East Africa are studied closely by students participating in the program. In North America, students gain hands-on experience raising Atlantic salmon right in their class through the winter, followed by a field-trip to release the fry in the spring. Additionally, the program is supported by multiple in-class visits by the Aqua-Links Coordinator. 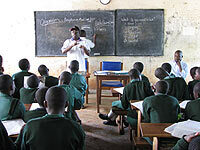 At the same time, students in Uganda receive lessons by program partners from NaFIRRI (National Fisheries Resources Research Institute) and link to North American students via the internet. Since January of this year, 10 schools in the Greater Toronto Area, Bowmanville and Peterborough have been raising and monitoring endangered Atlantic salmon right in their classrooms as part of the Aqua-Links Program. The students felt a personal connection to the fish and were invested in the entire process. From late May to early June, with the help of program partners at the O.F.A.H. (Ontario Federation of Anglers and Hunters), we released our second cohort of Atlantic salmon into the wild! Students from Churchill Heights Public School - Scarbrough, Captain Michael VandenBos Public School - Whitby, Westmount Public School and St. Anne Catholic School - Peterborough, and Toronto Heschel School released the small fry into the Duffins Creek, Cobourg Creek and the Credit River with enthusiasm and well-wishes. Internet linking with Ugandan partners will continue until the end of the school year at which point students in both countries will have gained first-hand knowledge of the kind of issues surrounding water conservation in 2011.